The Pearl Coalition has raised half of the $300,000 necessary to complete repairs of the vessel before moving it to DC. Their goal was to have the ship brought to the Southwest Waterfront by April 15th, the anniversary of the escape. As a part of the redevelopment of the Southwest Waterfront by the Hoffman-Struever team, a cultural use must be included. Another cultural use under consideration by the development team is a Navy Museum. 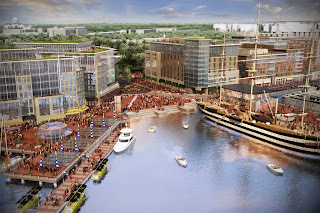 Above is a rendering of the redeveloped Southwest Waterfront, which includes a schooner, from the Southwest Waterfront website. Great story. Can't wait for it to dock in our neighborhood!